Many native cultures have given names to the full moon. Snow Moon refers to February’s full phase. 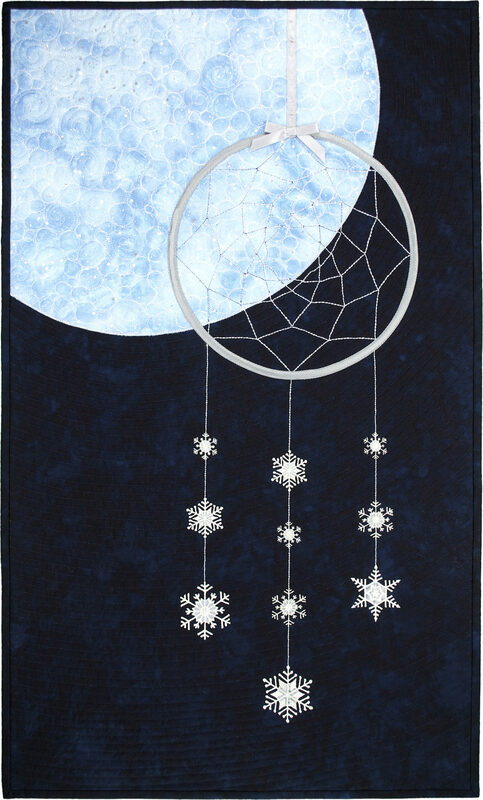 I was inspired by Native American lore, thus the dream-catcher echoing the shape of the moon and allowing only happy dreams through its web. Ice-dyed moon fabric, covered with sparkle tulle. Bobbin thread-work. Machine appliquéd and quilted. Hand-dyed and commercial batik fabrics, sparkle tulle, metallic and polyester threads, iron-on embroidered snowflakes, ribbon.